LINCOLNSHIRE, IL--(Marketwired - Apr 5, 2016) - Bentley's Pet Stuff, a family-owned healthy pet foods business founded by Lisa and Giovanni Senafe, along with entrepreneur Marcus Lemonis, host of CNBC's reality series The Profit, today announced the acquisition of The Natural Pet, a leading local pet products store in the Milwaukee area. Following the recent acquisition, plans are in place to renovate and expand the current facility over the coming months. Previous owner, Kim Hecker, opened The Natural Pet at 2532 East Oklahoma Avenue in Bay View, WI in 2003, and enjoyed great reviews on the staff's friendly service, expertise and quality of their natural pet products. Hecker and staff will continue to work at the newly merged business to assist with the expansion of the Bentley's Pet Stuff brand. "Bentley's Pet stuff and The Natural Pet share a passion for delivering the best quality products for our pets," said business partner, Marcus Lemonis. "With 12 new locations in the works for the Milwaukee area, we are extremely proud to expand our portfolio with The Natural Pet location and look forward to continue serving the greater metropolitan area with the same exceptional service customers have become accustomed to." Bentley's Pet Stuff sells natural food, pet care essentials, toys, grooming products and treats for their four-legged friends. The company focuses on the three critical elements in caring for pets: to nourish, energize and reward. 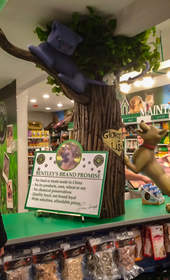 Specialty pet food brands such as Fromm, Orijen, Zignature, Honest Kitchen and Stella & Chewy's can be obtained at all Bentley's Pet Stuff locations. In addition, seasonal products and holiday gift items are available for purchase throughout the year. Lisa Senafe, CEO and Founder of Bentley's Pet Stuff, stated, "We are very excited to add The Natural Pet to the Bentley's family." Mrs. Senafe added, "Consistent with our prior acquisitions, we expect this new location to highlight our commitment to promoting healthy foods and treats for the well-being of animals." In February, Bentley's announced its first Milwaukee area acquisition with the purchase of Pet Outpost at 4604 N. Wilson, Shorewood, WI. Additional Milwaukee area locations and new markets will soon be announced. For more information regarding Bentley's Pet Stuff visit online at www.petstuff.com. For business opportunities, contact Giovanni Senafe at 708-214-4197. Lemonis is known as the "business turnaround king" and host of CNBC's prime time reality series, The Profit, in which he lends his expertise to struggling small businesses around the country and judges businesses based on a "Three P" principle: People, Process, and Product. The Profit airs Tuesdays 10pm ET/PT on CNBC.